In December I visited my younger son in Berlin, where he was living on an art grant. He’s a painter, perhaps in part thanks to my having dragged him through art galleries when he was young. We took the train to Leipzig, on a joint pilgrimage. He’d come to see the art museum, which filled with the works of a remarkable 20th century painting movement of which I hadn’t been aware. Now he was showing me a museum, though I didn’t have to be dragged. It was great stuff. 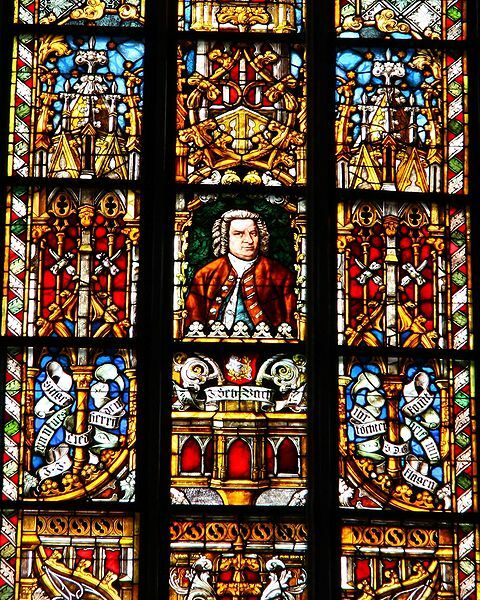 My chief destination was the St. Thomas church, where Bach was choirmaster and organist for the last 23 years of his life, a period of unprecedented musical productivity for him, or for anyone before or since. He’s buried there. The boy’s choir Bach ran has sung continuously since 1212, and they still sing Bach every Saturday afternoon. The church was bigger than I expected. The fee for the concert was smaller – 2 Euros. Which perhaps explains why it was almost full when I got there, with at least several thousand people. 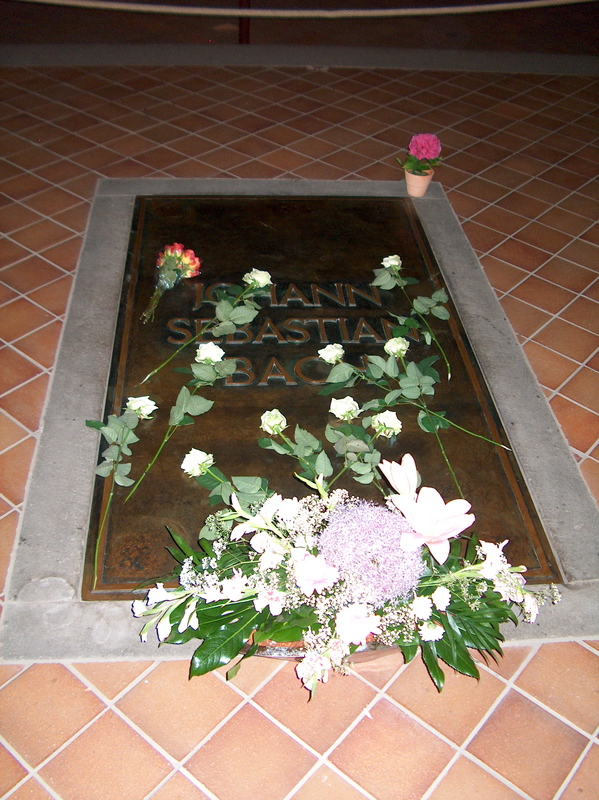 I stopped at Bach’s grave, a black stone with just his name carved in it, and tears came to my eyes. I remembered what I’d read in a guidebook, that his bones had been moved there in 1950, 200 years after his death, after the church they were originally buried in was bombed by the allies during World War II. I was born in 1950, and entertained a fleeting thought of mystical connection, a habit of mine since even before the supernatural days of 1968. Feeling the crowd streaming in past me, I rushed to look for a seat. 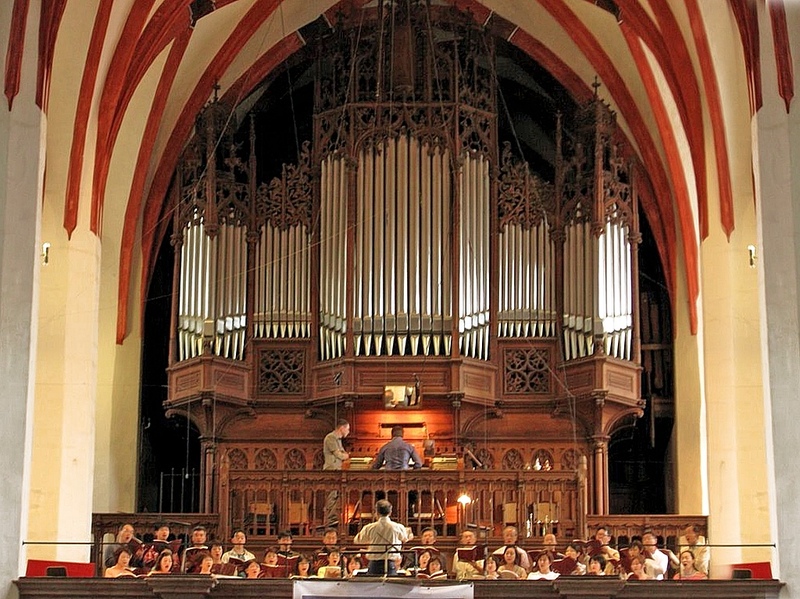 The pews downstairs looked full, so I climbed to the balcony overlooking a little stage, high up under the massive pipes of the organ – not the one Bach had played, butwhere the organ had been that he played. The pre-concert action was pleasantly informal. Fiddlers sat conversing in the seats below me, and players wandered on and off stage. I choked up again as the members of the choir approached their places under the organ– though different faces, this was the same group that premiered five years of cycles of Bach’s Cantatas and the St. Matthews Passion. I expected young boys – though not the unruly bunch that sometimes gave Bach such trouble. These singers looked to be in their twenties. And half of them were girls. The orchestra was tiny, similar to what Bach would have worked with. The chorus was bigger than Bach’s group of boys, and easily filled the large church with their clear, sweet voices. Bach had been a master organist. I looked at the guy who now sat at the organ and wondered at how he must feel trying to fill such enormous shoes. And I wondered about the conductor, because when Bach was not at the organ he had stood conducting on that very spot. But both men looked quite relaxed, enjoying making the music. The concert opened with a number of short works by composers other than Bach, including a lovely piece by Orlando Lassus, an earlier composer, who I realized I hadn’t heard since that basement at Wesleyan, a month or so before I heard the Mass. Here he was again warming me up for Bach. It was the advent concert – and I again felt a connection with distant Christmases. They sang the Magnificat, one of the few Bach pieces I don’t own on CD, and thus don’t know well. That added novelty to the experience. The eight or so strings were now joined by winds and those D trumpets, which in Bach always sound like they’re blasting from the lips of angels. I’m often uncomfortable at concerts: I don’t like crowds, and have never liked sitting captive since I was in school. But here I was back in that basement in the music building, feeling myself transported to a place above my squirming body, above the high ribbed ceiling of the St Thomas church, to that cathedral in sound. My only complaint was that the Magnificat is so short. I would have gladly skipped dinner to hear them perform the whole 2 ½ hour B Minor Mass. Can you imagine living in an age before music could be recorded? Where the only way to hear any composer's work would be to hear it live? How wonderful that you were able to experience Bach in such an historic place . . .
Actually, I just finished reading a biography of one of my favorite semi-obscure composers, Edward Elgar. He lived in such a time, and as a self-taught orchestrator had to wait three years for a music festival to come to his home in Worcester in order to hear the music he loved. 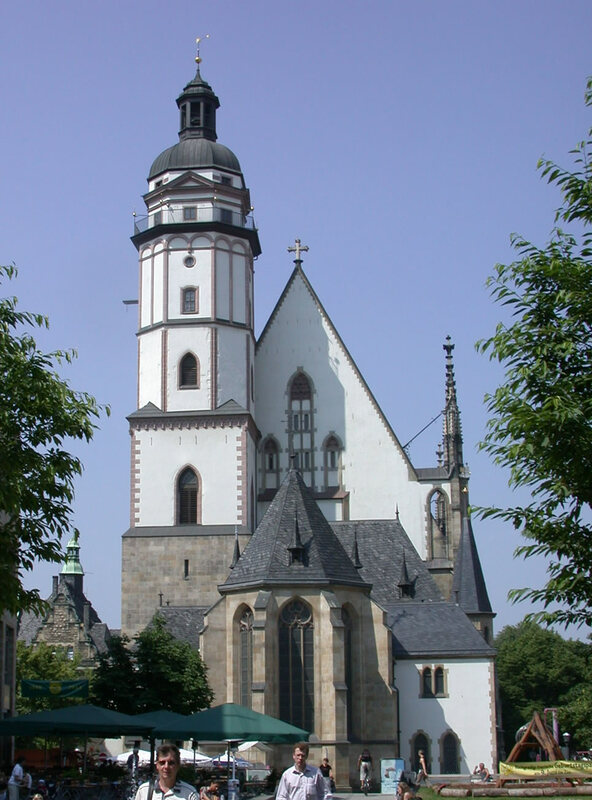 I visited this church, and Bach's birthplace in Eisnenach. Extremely moving. Thank you for this lovely post. B Minor. Quite soulful. My key was A, A minor. It's amazing that 300 years after his heyday, his music still sounds so vital. Sounds like it was a great experience. I love this. =o) You make me feel as if I had been there. I remember hearing the St. Matthew Passion in it's entirety at the Carmel Bach Festival about 18 years ago, and was blown away by it. And yes, I imagine J.S. Bach's shoes would take a LOT of people to fill. Your comments about filling the shoes of J. S. Bach reminded me of a story about Bach and the French clavier player Louis Marchand, who had just earned himself a highly paid position at the court in Dresden by demonstrating his virtuosity to the King. The concertmaster at Dresden, Volumier, had heard Bach and knew of his reputation. He suggested a competition, to which Bach readily agreed. Bach writes Marchand, who apparently a talented blowhard, and proposes a meeting where each would perform ex tempore whatever the other chose for him. Marchand agreed, and everyone , including the King, showed up for the showdown, except Marchand, who had already left town! has many fine things. I like both symphonies, and parts of The Light Of Life at least as much as Gerontius. Cockaigne. And the piano quintet - he's barking up Beethoven's tree there. Elgar nerds. What could be more unfashionable? I am a jazz lover which means that I also love classical music. I was driving home from Madison Monday evening in a severe thunderstorm. The sky was alive with a deluge and lightning in every direction. I was on the raod from approx 7:30-10:15PM, driving north on US 51(I-39). I have satellite radio in my car. I have been tuned to what Sirius calls their "Pops" station which has all of my favorite classical stuff. It had been pouring so hard that I parked under an overpass as I couldn't see clearly enough to drive safely. I just sat there and kicked back, kicked Bach? ?, and enjoyed about 20 mins of wonderful things. I find that certain types of music makes driving much more enjoyable. Of course, living in WI, I get to do more than my share of rurally peaceful driving. I'd love to visit the places you've shown us. I consider the B-minor mass to be the best thing ever created out of the mind of human beings. The Magnificat is lovely but the B-minor is worth not only skipping dinner but fasting the whole day. What a detailed, wonderful piece. I felt like I could hear the composer myself. Will listen to some Bach now. Thank you, Beth! And check out the first part if you haven't seen it. Thanks again for these two essays. I'll probably never get to Leipzig, but friends have brought back reports of experiences such as you describe. where I offer my own homage to the man.